I'm in the process of re-organizing a ton of mostly static content on several of my Web sites and in order to make it easier to manage the boat load of ancient content I have sitting around in many places. 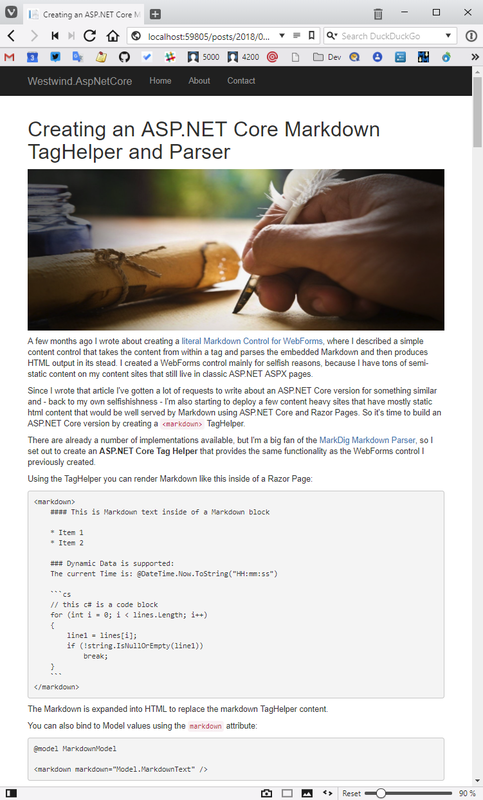 Writing content - even partial page content - as Markdown is a heck of a lot more comfortable than writing HTML tag soup. 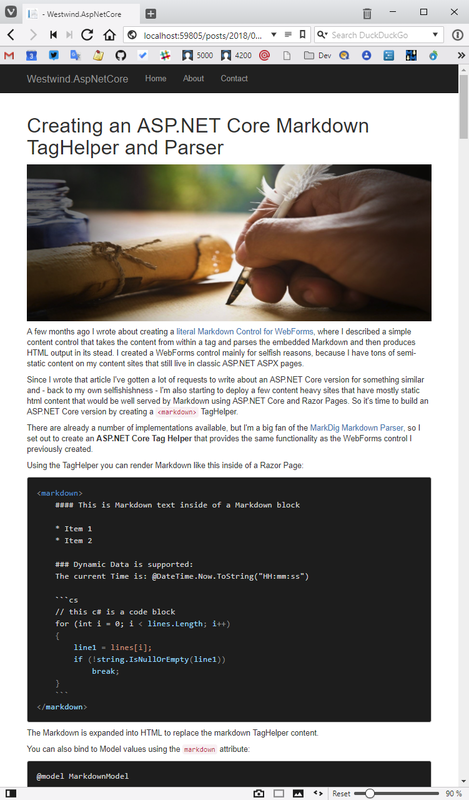 So to make this easier I've been thinking about using Markdown more generically in a number of usage scenarios lately, and I wrote last week's post on Creating a Markdown TagHelper for AspNetCore and an earlier one on doing the same thing with class ASP.NET WebForms pages. These controls allow for embedding Markdown content directly into ASP.NET Core MVC Views or Pages and WebForms HTML content respectively. But in a lot of scenarios even these controls add a lot of unnecessary cruft - it would be much nicer to simply dump some Markdown files and serve those files as content along with a proper content template so those pages fit into the context of the greater site. This typically means access to a layout page by way of a generic template into which the Markdown content is rendered. By using plain Markdown files it's easier to edit the files, and when you host them in a repo like Github as they can just be displayed as rendered Markdown. In short it's a similar use case, but meant for content only displays that's ideal for Documentation sites or even things like a file only Blog. 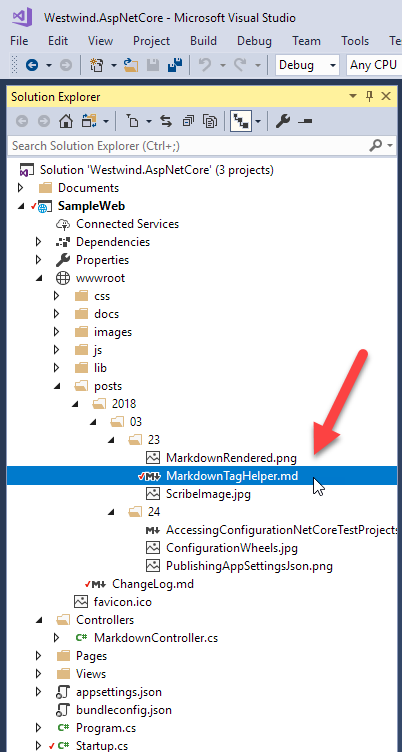 So in this post I'll describe a generic Middleware implementation that allows you to drop Markdown files into a folder and get them served - either as .md extension files, or as extensionless Urls based on the filename without the extension. The idea to process Markdown files directly is nothing new - it's a common feature in standalone documentation and CMS/Blog generators. But wouldn't it be nice to have this functionality as a simple, drop-in feature that you can attach to any folder that is part of your existing Web application? In many of my dynamic Web sites, I often have a handful of information pages (like About, Terms of Service, Contact us, Support etc.) that are essentially static pages. And for those simple Markdown formatting is a perfect fit. Additionally many sites also need documentation and having a separate area to actually document a site with simple Markdown files. You use only Markdown text, and leave the site chrome to a generic configured template that renders the reusable part of the site. When creating content all you do then is write Markdown - you can focus on content and forget the layout logistics. What do we need to serve Markdown Pages? So, today I sat down to build the start of some generic middleware that processes Markdown content from disk and renders it directly using a configurable MVC View into which the Markdown content is rendered to provide the 'container' page that provides the styling and site chrome that you are likely to need in order to display your Markdown. This template can contain self contained HTML page content, or it can reference a _Layout page to provide the same site chrome that the rest of your site uses. The idea is that I can set up one or more folders (or the entire site) for serving markdown files with an .md extension or extensionless Urls and then serve the Markdown files into a configurable View template. The middleware is a relatively simple implementation that looks for a configured folder and extensionless urls within (think Docs for documentation or Posts folder for Blog posts) or .md files in the configured folder. When it finds either, the URL is processed by loading the underlying Markdown file, rendering it to HTML and simply embedding it into the specified View template. The first step is to configure the Markdown processor by telling it which folders to look at. You specify a site relative folder, an optional MVC View or Page Template (the template has to exist) and a few optional parameters. As usual for ASP.NET Core Middleware, you need to both hook up ConfigureServices() configuration and engage the Middleware in Configure(). Next we need a Razor template that will host the rendered Markdown. This template is the "site chrome" that surrounds a rendered Markdown page. Each folder you configure can have its own template, so it's possible to vary the template. The template is just a Razor page that receives MarkdownModel which includes among other things a Model.RenderedMarkdown that you can embed into the page. The template has really nothing in it except the rendered markdown. All the rest of the 'site chrome' will be picked up by the _layout.cshtml page which provides the over look and feel of the page. Note that the title parsing is optional, but it is enabled by default. The middleware checks for YAML header and title: property or a # Header tag in the top 10 lines of content. The default configuration works both with an .md extension or no extension. When no extension is specified the middleware looks at each extensionless request and tries to append .md and checks if a file exists then renders it. Keep in mind this is pretty much a stock ASP.NET Core project - it uses the stock Bootstrap template and I haven't made any other changes to the layout or page templates, yet the markdown file just works as a drop in file. Most likely you'll want to spruce up things a little bit. If you're doing software related stuff like documentation or a blog posts one of the first things you'll want is syntax highlighting. I'm a big fan of highlightjs which comes with most common syntax languages I care about, and provides a number of really nice themes including vs2015 (VS Code Dark), visualstudio, monokai, twilight and a couple of github flavors. If you want to improve performance a little, don't use extensionless URLs for the markdown files. The way the implementation currently works extensionless URLs require intercepting every extensionless URL request and checking for a Markdown file with an .md extension. Using just .md files will only affect files that actually have an .md extension. This can be mitigated with some caching behavior - I come back to that a bit later in this post. The default Markdig configuration has most of the pipeline extensions enabled so most things just work, but if you want optimal performance for your Markdown processing explicitly whittling the list down to just what you need can yield better performance. So how does all of this work? As you might expect the process of creating this is actually not very difficult, but it does involve quite a few moving pieces as is fairly standard when you're creating a piece of middleware. The core bit is the actual Middleware extension that is hooked into the ASP.NET Core middleware pipeline. 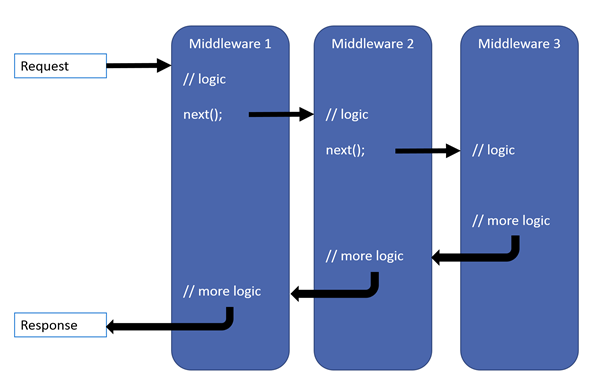 The idea behind Middleware is quite simple: You implement a middleware handler that receives a context object and calls a next(context) which passes the context forward to the next middleware defined in the chain and it calls the next and so on until all of the middleware components have been called. Then chain reverses and each of the those calls return their task status back up the chain. Middleware can handle both 'before' and 'after' operations - 'before' you pass on the call to next() for providing inbound functionality which is the most commonly used for the main middleware functionality. The 'after' processing fires after the call for next() completes which occurs after the chain has basically reversed. If you've used HttpModules in ASP.NET previously you can think of middleware as a module that can handle both pre-handler and post-handler operations in a single interface. The 'after' handling can be used for cleanup or in post-processing final output (although that's actually pretty tricky given that the output stream like is complete already). If any middleware component wants to terminate the pipeline after its inbound processing, it can simply not call next() and the chain reaction ends and reverses out. All the previously hooked up middleware still fires its post-next() code. In this scheme the order of middleware components is very important since they fire in order declared. For example, it's crucial that things like the Authentication, Routing and CORS middleware bits are hooked up before the MVC middleware executes. Implementing a dedicated middleware component usually involves creating the actual middleware component as well a couple of middleware extensions that allow for being called in ConfigureServices() for configuration (ie. services.Add<MiddlewareName>()), and Configure() for actually attaching the middleware to the pipeline (ie. app.Use<MiddleWareName>(). Yeah I know - talk about misnamed handlers: Configuration usually happens in ConfigureServices() where you configure the dependency injected components either directly or via callbacks that fire on each request and attaching the middleware is done in Configure() - no configuration usually happens in Configure() according to the patterns Microsoft has laid out. Go figure. So lets look at the actual implementation of the Markdown Middleware. The key bit in this middleware uses Context.Request.Path.Value to grab the request path and based on that path determines whether the request needs to be passed on to the Markdown controller that renders the template. Most of the code above deals with checking the URL and if it is a match via processAsMarkdown path is simply rewritten to point at the MVC controller that renders the Markdown. Since we are rewriting the path, the controller has to know where to find the original physical path, since the request path has changed when the controller fires. To make this work the middleware creates an initial model and stores the original file physical and relative paths on the model. The model is then stored in Context.Items to retrieve in the controller which can then pick it up when the request is re-routed to the controller. This fixed route is found even though it lives in an imported library. Note that this route only works in combination with the middleware because it depends on preset Context.Items values that were stored by the middleware earlier in the request. The main controller code reads the model from Context.Items, retrieves the original path and then checks to ensure the file exists. If it does reads the markdown from disk and passes it to a helper that populates the model. The ParseMarkdownToModel() helper tries to extract a title and parses the markdown to HTML and stores those values on the model. The resulting model is then fed to the view specified in the folder configuration. Et voilà! We have rendered Markdown documents. The actual Markdown Parsing is handled by helper functionality in the library that includes the logic for configuring and implementing a specific Markdown parser. This library uses the popular Markdig parser by default. I covered how the Markdown Parsing is handled in my last post and if you're interested how the Markdown pipeline is set up you can review it there. As I mentioned earlier this middleware has some overhead because it has to effectively look at every request for the folders you have configured and check either for the .md extension worse for extensionless URLs check whether the file exists. Therefore I recommend that you are very specific about the folders you set up to serve markdown from rather than making this a global hookup in the root folder. Use specific directories like /docs/ or /posts/ etc. rather than just setting the entire site to use the root / site. There's some opportunity for optimization here as well. Output caching on the controller is one thing that would help, but I couldn't actually get this to work with server side caching - ResponseCache doesn't seem to work on the controller most likely due to the fact that the path is rewritten from the original URL. For caching to work it would have to be handled in code using a Memory (or other) Cache object directly and mapping to specific URL paths. It would also help to cache file lookups to avoid the disk hit for file existence checks which are relatively slow. Keeping track of files that were previously checked could avoid that process. One advantage of the way things work now is that you don't have to worry about updating Markdown files on the server because currently there is no caching. Change the file and it will be picked up immediately in the next request. There's still stuff to do with this library, but I've thrown this into a few internal projects and so far it works great. These projects are applications that have lots of dynamic content, but also have several sections that are mostly static text which previously was hand coded HTML - I was able to throw out a bunch of these HTML pages and convert them to Markdown in Markdown Monster using the built-in converter. Since these were already in Markdown friendly simple semantic HTML they converted to Markdown quite nicely. The Markdown files greatly simplify editing and I've been able to pass of these documents to other non-coder types to edit where previously it was just easier for me or somebody else on my team to write the html ourselves. This is nothing overly complex, but I find this drop in Markdown functionality incredibly useful and I'm sure I'll be using it extensively in the future. I hope some of you find this useful as well. If you end up using this library and you find issues or feature holes, please file an issue on Github. Enjoy.